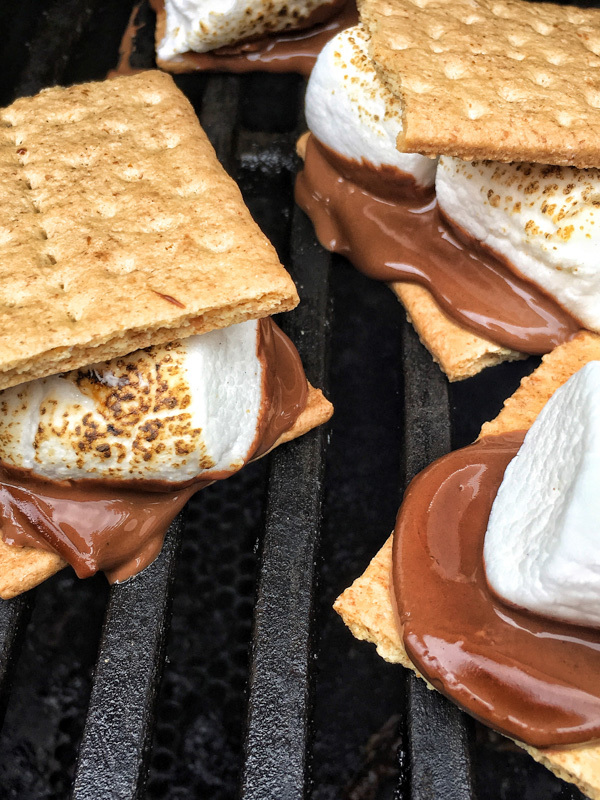 After a weekend of croissants, cheese plates, Easter candy (why are Cadbury Eggs so GOOD? ), strawberry rhubarb pie, ham & egg breakfast sandwiches, hot dogs, tater tots and GIN… this is what I need to eat for dinner tonight. And we’re off. We start with the dressing. First mince the garlic in a mini food processor Mini Food Processor. Then we add the rest of the ingredients. Look at how creamy it is! If you find it too thick, add a little more water to thin it out. And we transfer. You could stop here and just dip vegetables in it. Glorious. 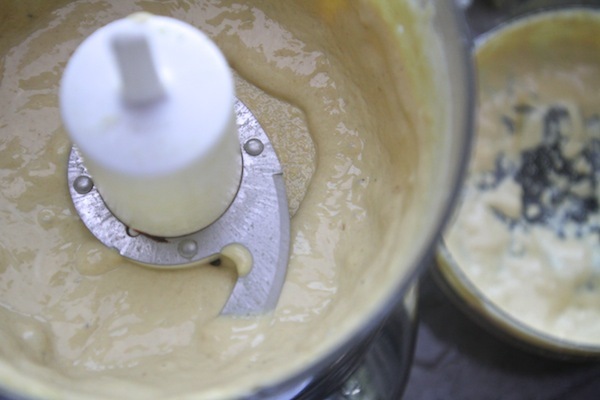 Let’s use this lemon tahini dressing! 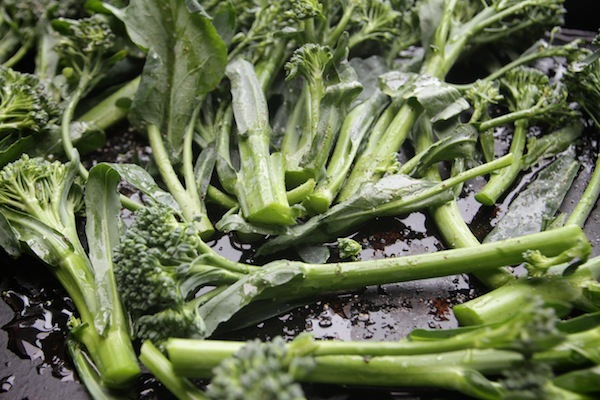 Transfer the broccolini to a baking sheet. Toss with olive oil and season with salt & pepper. ROAST. Turn half way and continue to roast. I love how the edges get crispy. Let’s top with the dressing. 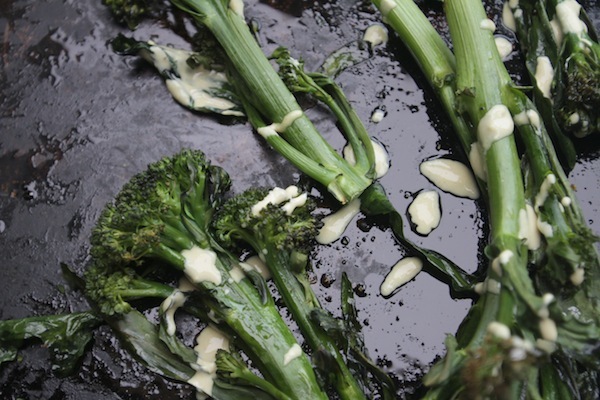 Drizzle some on top of the broccolini with a fork. It’s great cold the next day. Here’s to health! Preheat oven to 425F. 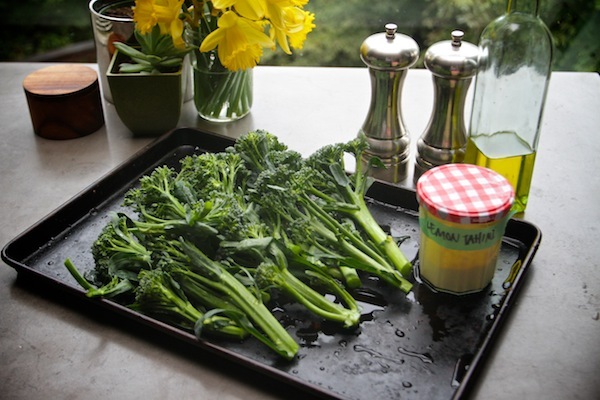 Transfer broccolini to a baking sheet. 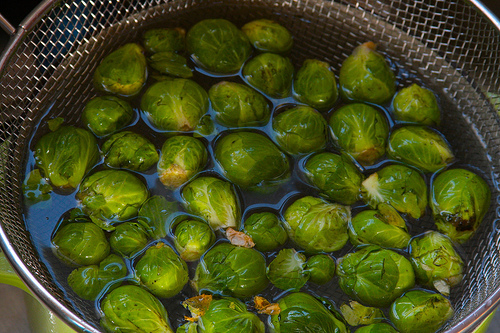 Toss with a few glugs of olive oil. Season with salt & pepper and roast for 10-15 minutes, making sure to toss at the half way mark. 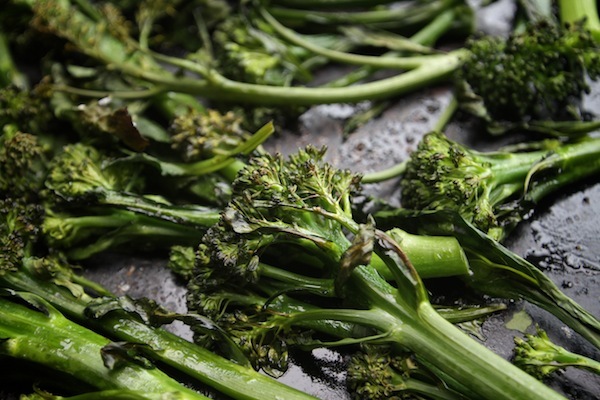 Broccolini should be tender but still maintain a little crunch. 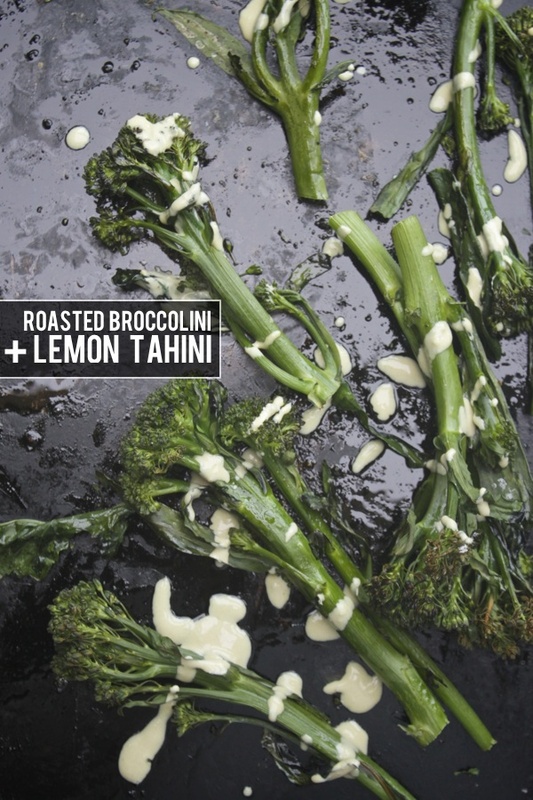 Drizzle hot broccolini with lemon tahini dressing and serve immediately. In a food processor, pulse the garlic to mince it. 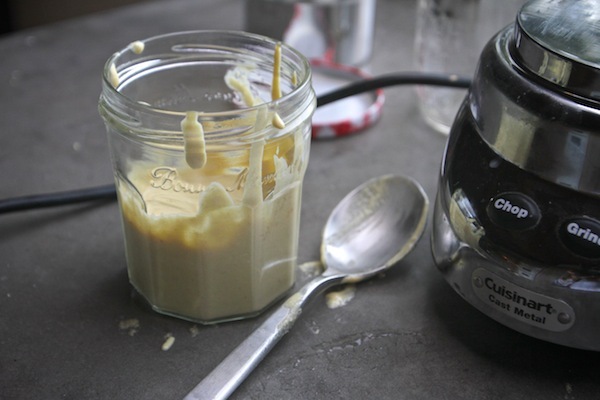 Add the tahini, lemon juice, nutritional yeast, oil, water, salt and process until smooth. If dressing is too thick, thin out with a tablespoon or two of water or oil. 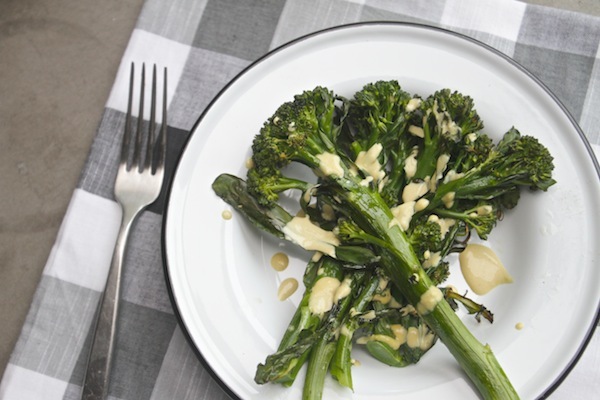 I love broccoli all crisped up like that, Tracy … and I discovered tahini when I moved here to Greece. It’s very popular here … great idea to make a dressing with it! 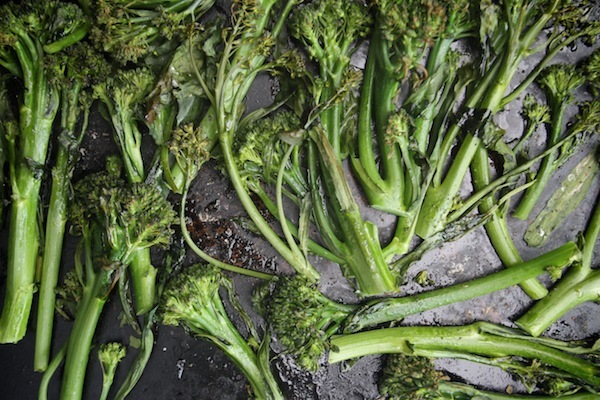 I just had a bunch of sprouting brocolli and dying to try this recipe! 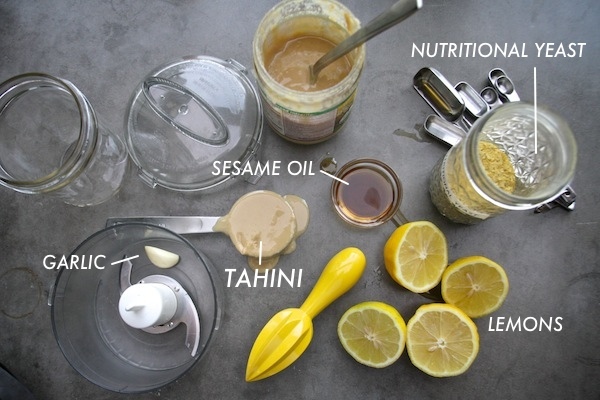 Oh, I love lemon+tahini. I’ll bet the sesame oil makes it even more glorious. I’ll have to try this soon! I’m with you, I put Cabury creme eggs in my sons basket, just so I can eat them! 🙂 I just got this cookbook and this recipe looks awesome! I wanted to make the lemon tahini dressing the other day but Whole Foods was out of nutritional yeast. 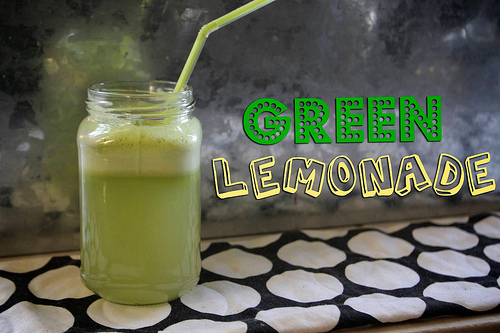 Hopefully they have some now because I want to make this tonight! Thanks! 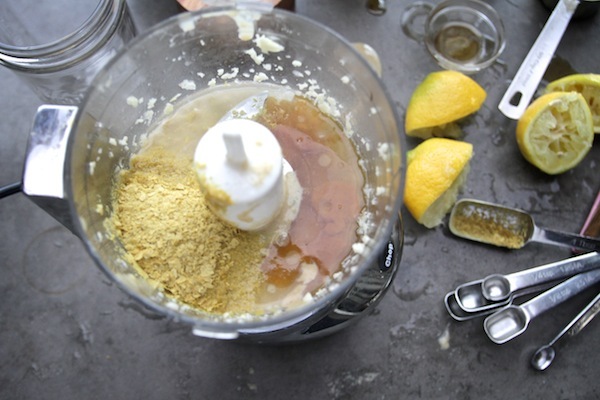 Adore nutritional yeast! Love the cheesy flavor. Can’t wait to try this with the kids! 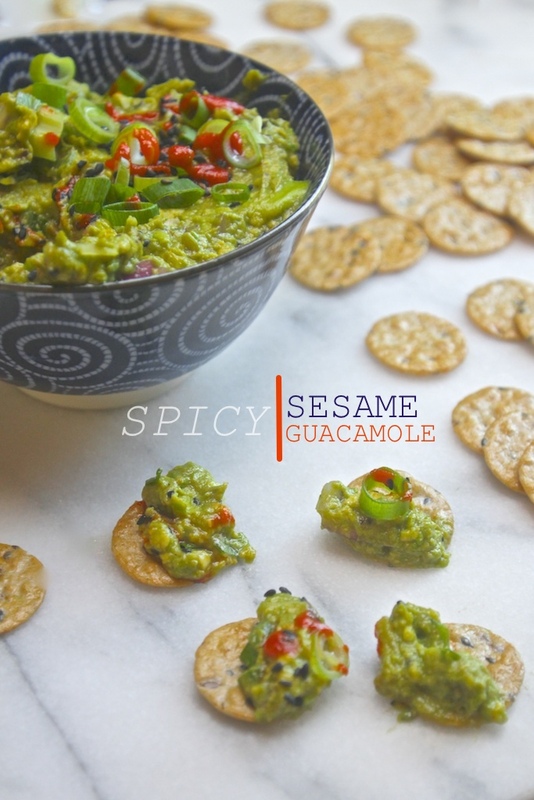 So simple and delicious and healthy! I can’t stop roasting vegetables, even now that the weather is warming up. It’s a foolproof way to get my boyfriend to eat veggies! And with this yummy sauce? Perfection. I adored roasted veg!! This looks simply divine! OMG, I am so excited to try this. 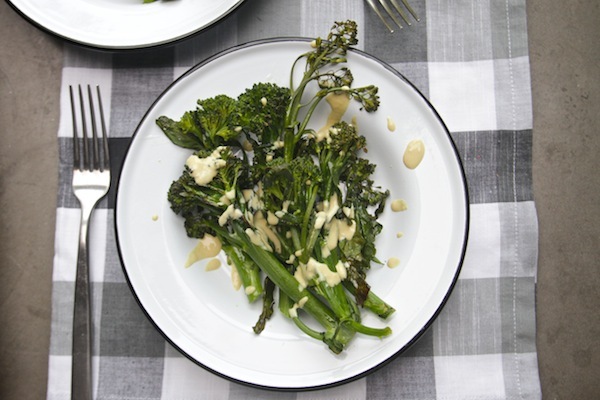 First of all, broccolini is one of my favorite veggies and this dressing sounds perfect. But generally, I agree. 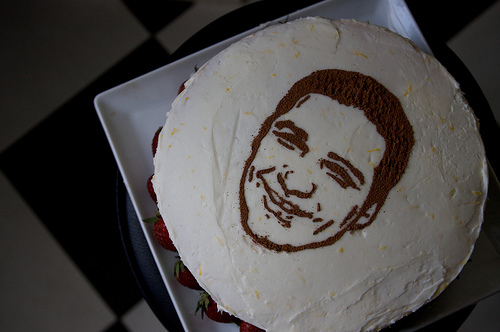 I need to eat this too. Why ARE cadbury eggs so good (among other Easter candies of course). I want to put this dressing on everything! I’m so pumped for vegetables! Excellent, I love having more easy dressings to keep in the fridge for veggies. In fact, for dinner I just ate flatbread smothered in the parsley/basil garlic spread you featured a month or two ago. I made a big batch and froze half, so it was a real treat to break it out yesterday and start applying it to everything. Keep those healthy recipes coming. I love them! last night…made it, ate it…divine! thanks for sharing! Tracey! Love this, thank you for sharing it. Definitely going to get some broccolini this week. You’re the best! Oh, hooray! 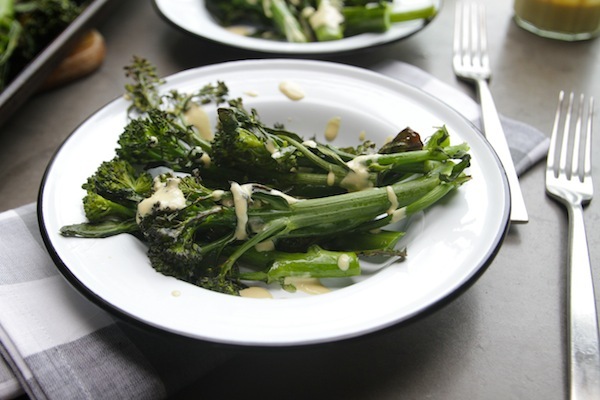 I have been all over broccolini for the past couple weeks–so glad to see it pop up here! And that dressing sounds just perfect. I’m going to make this tomorrow night! looks delish! PS Your “healthy” recipes are my favorite. They are always right on point and make a body feel good. This is my type of dinner! long time blog reader and podcast listener (**love singing the podcast song and know the reference to all lyrics in song…ah shucks!) and I have never commented on your blog! (*sorry*) but I just wanted to applaud you for posting the healthy recipes cause I love them all. 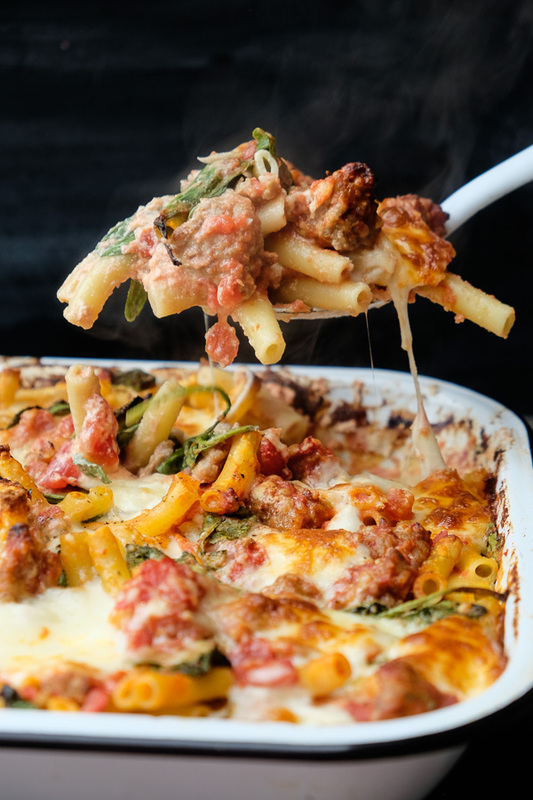 My husband (a health nut) loves when I cook from your recipe repertoire and I love when you post the unhealthy things, love reading the “how to” and dreaming about creating said sweet things. 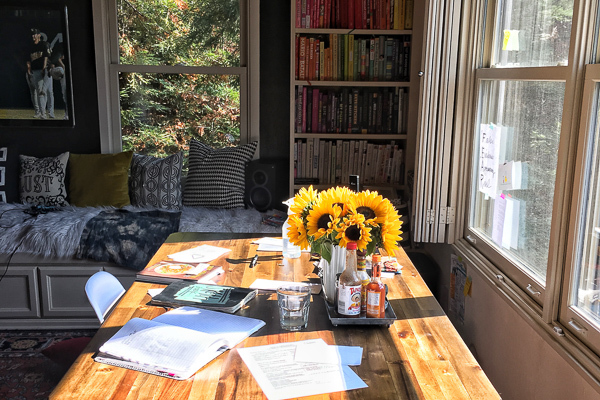 I so appreciate your palette and love planning parties with your recipes. Thank you for your creative spirit and posting yummy dishes. And BTW, your garlic bread is the best I’ve ever had. My mom and her gaggle of friends (all in their 60’s and 70’s) now all make your garlic bread. I live in Oakland and hope to run into you some where in the Bay Area! As for the blog burn out, I hope this comment puts a smirk on your face and pep in your step! I’m currently in my “fat jeans” and they’re pinching at my tummy. I also have half an Easter egg sitting in front of me. So yes, totally in the same boat, I need this for dinner! I love love love broc. I would totally add pickled shallots to this. Yum. Gotta go. Oh, I just love the title of this recipe. Sounds like a children’s rhyme. Somehow I missed this in The Oh She Glows cookbook—can’t wait to try it. YUUUUUM. This is getting made. Soon. Nice cookbook suggestion too! i love this dressing so much, i agree, goes on anything! I love these healthy recipes! I keep almost buying this cookbook. I need to just DO IT!! The hubby and I are big broccolini eaters, we just love the stuff! I made broccolini pizza almost every Saturday. That dressing sounds so delicious, Tracy, I’m sure it would be great on several other veggies, too! Crispy broccolini heads are sooooo good. This just made my mouth water. I’m seriously loving these healthy recipes. My waist line appreciates you. I love your recipes! As a thanks, send me an email and I will gladly send you one of my companies candy gift baskets! Seriously, thanks for all your hard work. 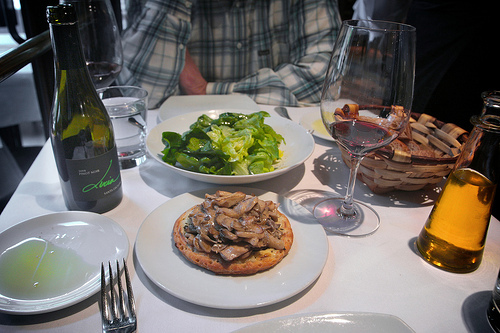 If you like that Tracy, try this as a whole bona fide meal. Buddha bowl- very similar dressing but you roast sweet potatoes, red onion and kale with it too, as well as have some spiced crunchy chickpeas! So so good.